This Safavieh Courtyard area rug adds a touch of modern flair to the design of any area in your home. Decor done right with this indoor/outdoor piece, and its plush synthetic material. High-quality and high fashion, this machine-made rug is perfect for you. This geometric patterned beige tan rug makes a contemporary mark on your home's interior design. 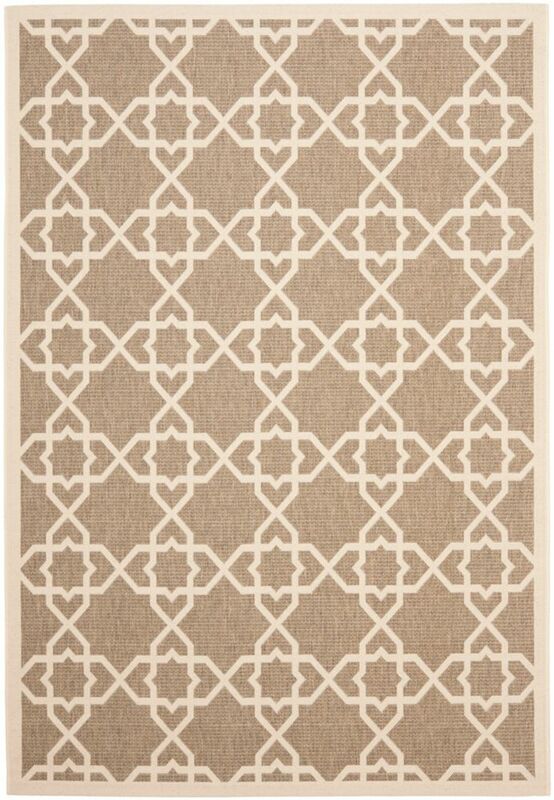 Bring this Safavieh Courtyard area rug into your dining room for an easy splash of style. Keep the contemporary look in your home with this indoor/outdoor piece crafted from plush synthetic material. Comfort and quality come first in this machine-made rug. Keep things classy, yet high-quality with this geometric patterned blue rug. Courtyard Jared Brown / Beige 8 ft. x 11 ft. Indoor/Outdoor Area Rug This Safavieh Courtyard area rug adds a touch of modern flair to the design of any area in your home. Decor done right with this indoor/outdoor piece, and its plush synthetic material. High-quality and high fashion, this machine-made rug is perfect for you. This geometric patterned beige tan rug makes a contemporary mark on your home's interior design.